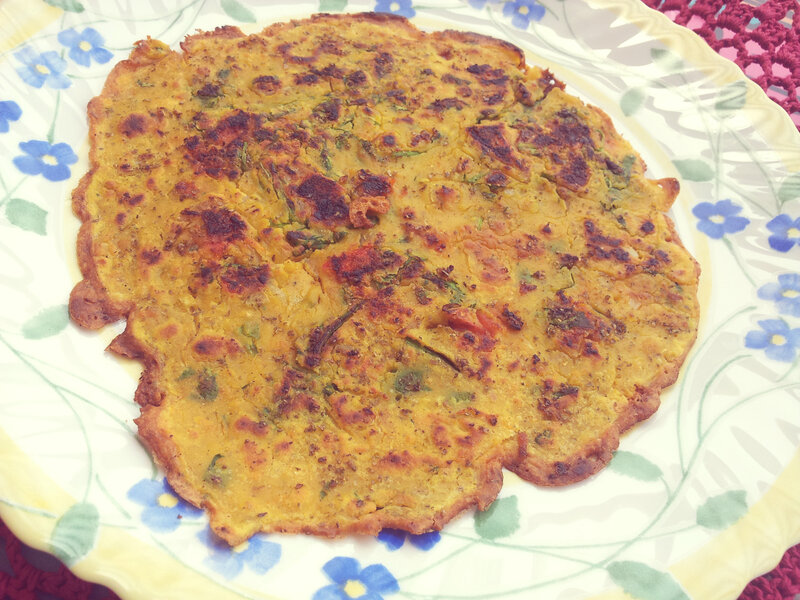 This is a recipe for Besan ka Chilla, simply put Indian savory pancakes made with chickpea / garbanzo bean / gram flour. This is a very easy to make recipe and is perfect for winter mornings or evenings. Goes perfectly with a cup of hot masala chai. Assembling the ingredients is also very easy. This is my go-to weekend breakfast recipe and is quite filling as well. Chickpeas are an excellent source of proteins and this is an easy gluten free option as well. 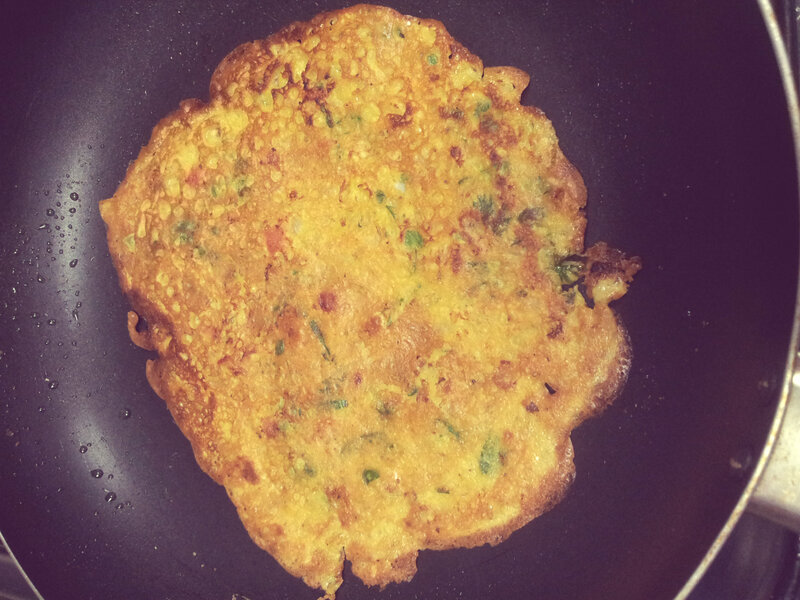 You can add any vegetables to this versatile crepe / pancake recipe. Sometimes I like to add capsicum or shredded carrots to the mix. In a mixing bowl, sieve the besan and add all the dry spices and salt. Mix well with a spoon. 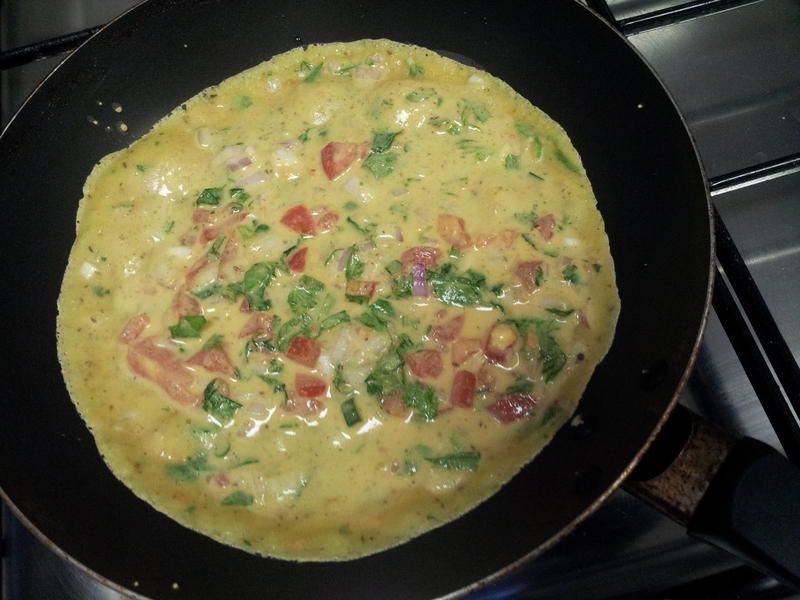 Add chopped onions, tomatoes, spinach, coriander and chillies to this mixture. Add little water and mix. Keep adding until it reaches desired consistency. Some people like the batter to be thick while some like it runny. I prefer reaching a mid point. 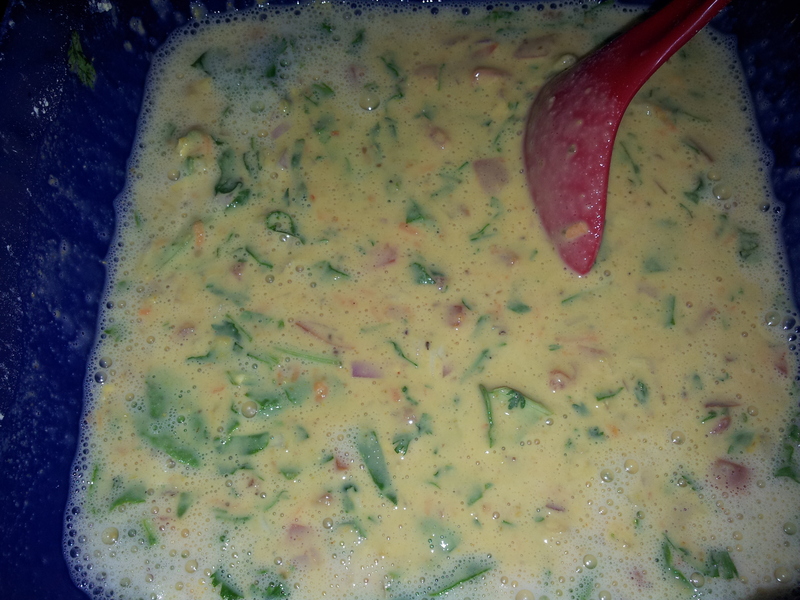 Here’s how my batter looks like. Now on a greased hot pan over low heat, drop a ladle full of the batter and let it take shape. Let the mixture cook. Add any regular oil to the sides and gently flip it over. Here’s where practice comes to the rescue. Let both the sides get evenly cooked. You are looking for a lovely brown look. I wish I had better pictures for this post. Serve with tomato chutney or any dip that takes your fancy. I prefer it with toasted bread and butter. Adding carom seeds aids digestion. Zataar powder can be skipped if you do not like it. I love chilla with nimbu ka achar or then just dahi! Thanks babe, let me know how it turns out.